Today, Thea tackles middle grade science fantasy novel Zahrah the Windseeker by Nnedi Okorafor! In the Ooni Kingdom, children born dada—with vines growing in their hair—are rumored to have special powers. Zahrah Tsami doesn’t know anything about that. She feels normal. Others think she’s different—they fear her. Only Dari, her best friend, isn’t afraid of her. But then something begins to happen—something that definitely marks Zahrah as different—and the only person she can tell is Dari. He pushes her to investigate, edging them both closer and closer to danger. Until Dari’s life is on the line. Only Zahrah can save him, but to do so she’ll have to face her worst fears alone, including the very thing that makes her different. Why did I read this book: First, I need to read more diverse SFF – not just featuring diverse characters, but written by diverse authors. 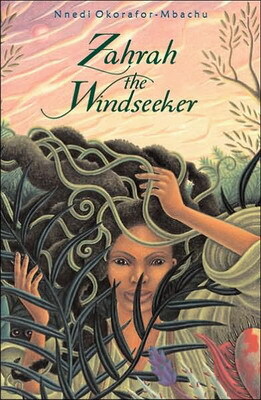 When I saw this middle grade fantasy novel about a girl with vines for hair, I was instantly hooked. 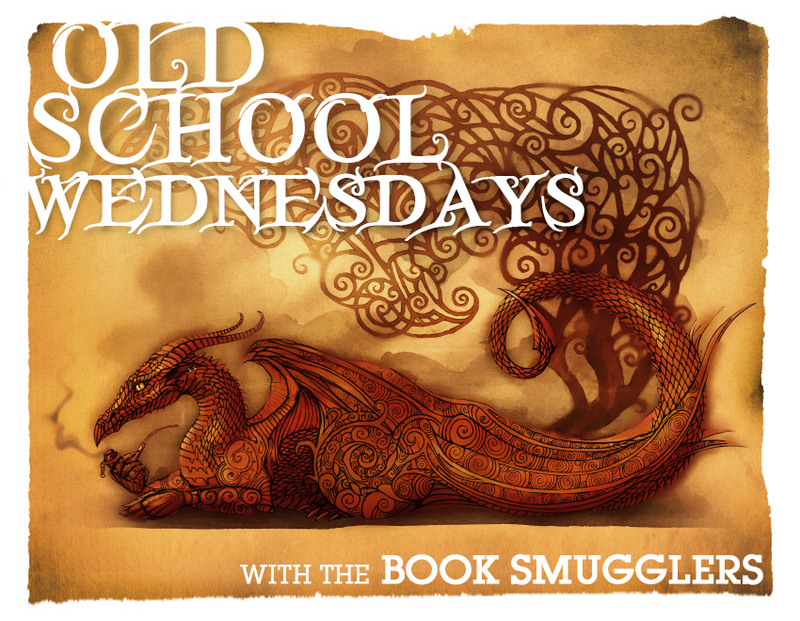 Then, I saw it was a Nnedi Okorafor book, published just over 5 years ago, and of course I started it immediately for this week’s Old School Wednesday pick. The planet of Ginen is a world of lush vegetation. Though their world is huge, everyone knows that humans only live in the few hundred miles of cities, towns, and villages that comprise the Ooni Kingdom. The kingdom is bordered by a vast expanse of wildlife that covers Ginen, known to all as the Forbidden Greeny Jungle. Everyone knows that to enter the Greeny Jungle is to invite certain death from monsters and magic – those who have entered the jungle never come back. Or, if they do come back, they’re crazed and sick. From the time they are children, the Ooni people learn to fear the Greeny Jungle and steer far away from its mysteries. It is, as its name suggests, forbidden. Thirteen-year-old Zahrah Tsami lives in a small town called Kirki, right on the border of the jungle. From the time she was born, Zahrah has been different than anyone else – she is dada, born with locks of hair interwoven with living vines. To be dada is incredibly rare, and many false stories and superstitions say that the dada are troublemakers, bad luck, no-good witches. Though Zahrah (and her parents and her best friend Dari) know that this is misguided nonsense, Zahrah grows up to be a quiet, solitary girl who pins up her dadalocks under cloth, and is resigned to quietly endure the taunts and names she’s called at school. One day, though, Zahrah discovers that at least some of the stories are true – being dada means she can do things that other humans cannot. With a little prodding from her best friend, the adventurous and ever-charming Dari, Zahrah is about to embark on the adventure of her life – right to the heart of the Forbidden Greeny Jungle. Here, she will test herself, and grow, in ways she never thought possible. Lush. Original. Inspired. FUN. These are the words that immediately come to mind after reading Zahrah the Windseeker. You know those books that make you wide-eyed with wonder? Have you ever felt or thought, wow, I wish this book was around when I was a child because it is that fascinating and unique and would have opened your young eyes to a whole new pantheon of fantasy and science fiction? THIS. This is that book. Zahrah the Windseeker is the story of Zahrah’s journey, literally and figuratively, as she pushes against the boundaries imposed on her by herself, and by her elders. From the beginning of her narrative, Zahrah is an introverted and shy young girl – she is very careful to follow the rules, and like her fellow northern Ooni dwellers, she makes sure that she always looks clean and civilized (northern slang for being stylish and put together). This is so much more important to Zahrah, because of her dadalocks and the way other people treat her. But one day, Zahrah breaks the rules by venturing into a forbidden Dark Market, and from there begins to test other things she’s been told by her parents. It’s funny how once you tell one lie, you can always tell more. At first, Zahrah is hesitant and dragged into adventure by the boisterous Dari – making her seem a passive character, more concerned with following rules and making sure her best friend isn’t alone, rather than out of a true desire for adventure. When he urges her to go into the Forbidden Greeny Jungle for the first time, Zahrah is in tears and stammering with fear. But gradually, oh so gradually, Zahrah finds her own inner strength and she understands that sometimes to do the right thing requires breaking rules. When she enters the jungle alone for the first time, she faces multiple foes and challenges – she’s also given chances to turn around and go home, to where she will be safe, to where she can find others to help her. But each time she considers giving up, Zahrah finds the courage to carry on. And that, dear readers, is pretty awesome. I love that Zahrah is not inherently an adventure-seeker and that she’s quick to tears and admits her terror – her resolve to carry on regardless is all the more brave and poignant because of this quiet vulnerability. Zahrah’s arc – from civilized, rule-following, shy girl to disheveled, flying (yes, flying), beast-fighting, windseeker. There are plenty of other fantastic characters, too – even though Zahrah is on her own for much of this book, it’s easy to understand why she loves best friend Dari so much. Loquacious, rebellious, and smart, Dari is a charmer and his enthusiasm is contagious. There’s also a mysterious figure Zahrah meets in the Dark Market, a woman from places unknown named Nsibidi – who also is dada, the first that Dari has ever met. Nsibidi’s story is only slightly revealed in this novel, but I desperately want to read more about her and her family from a different land. And the worldbuilding! Ginen is a wonder-filled place, where technology and biology are fused – monitors grow wild, handheld digital reading devices are commonplace, computers are nourished from seedlings to fully formed technologies. The people of the Ooni Kingdom are varied in culture and practice, too – depending on region, certain people specialize in metal-working, or pride themselves on appearance and brandish small mirrors everywhere they go. Others are great cooks, and some tribes are great botanists and architects. Although we never get to travel to these different parts of the Ooni Kingdom, each of these different people come to life in Zahrah’s narrative. Of course, the real heart of Zahrah the Windseeker lies in the heart of the Forbidden Greeny Jungle. Here, once Zahrah embarks on her journey to find an elgort egg and save Dari from death, her tale becomes episodic adventure spanning different friends and foes. There are telepathic talking panthers and whip scorpions and war snakes. There are trippy mangoes and honeybees and a village of kindly gorillas. There’s a wise and speculating, speckled frog – and Zahrah faces and learns from them all on her quest. And, all the while, there’s an (electronic!) guide book, offering Zahrah advice from intrepid explorers of the jungle before her. I say again: wow, I loved this book. If you’re craving a middle grade adventure that is original, invigorating, and perfect in just about every way, I implore you to read Zahrah the Windseeker. I loved it very, very much and it is most certainly on my list of favorite old school books read in 2014. When I was born, my mother took one look at me and laughed. “She’s…dada,” said the doctor, looking surprised. “I can see that,” my mother replied with a smile. She took me in her arms and gently touched one of the thick clumps of hair growing from my little head. I had dadalocks, and woven inside each one of those clumps was a skinny, light green vine. Contrary to what a lot of people think, these vines didn’t sprout directly from my head. Instead, they were more like plants that had attached themselves to my hair as I grew inside my mother’s womb. Imagine that! To be born with vines growing in your hair! But that’s the nature of dada people, like myself. Yay! Glad you liked this one. I think it’s my favorite book by Okorafor (maybe because some of her other books, especially the adult ones, tend to be pretty heavy; and although there is some of that in this one, it’s much lighter and more joyful). “(although I believe The Shadow Speaker is set in the same world)” Yes and no, Shadow Speaker starts on Earth sometime in the future where there’s an interesting blend of technology and magic going on but the characters do visit this world as well (and I think there’s a short story set on that future Earth as well, it’s a fun world she’s been playing around with). I found this book in high school, probably pretty soon after it was published, and holy crap I loved the heck out of it. The worldbuilding just grabbed me the way no other book ever has and I reread it so many times just for those descriptions alone and Zahrah and the actual story were pretty good too! I really loved how Zahrah went from being scared of the forest to respecting it and learning to enjoy what abilities she had, bit sad that Okorafor writes more adult fiction than YA since the adult fiction of hers which I’ve tried I haven’t liked nearly as much as this and Shadow Speaker.